HONUTM2040CLCHR : HON® Hon Utility Table, 40"W X 20"D - Rectangle Top - 40" Table Top Length X 20" Table Top Width X 1.13"
Hon Utility Table, 40"W X 20"D - Rectangle Top - 40" Table Top Length X 20" Table Top Width X 1.13"
All-Purpose Utility Tables From Hon Have A Place In Every Work And Educational Setting. This 40"L X 20"W Table Comfortably Seats One Person While Conserving Floorspace. The Top Is Scratch- Spill-, And Stain-Resistant Laminate. Laminate Color Is Harvest. Paint Color Is Putty. 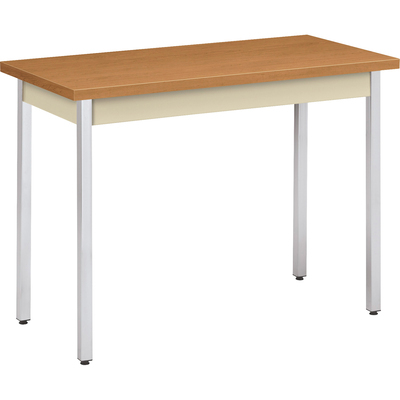 Leg Finish Is Chrome..
All-Purpose Utility Tables From Hon Have A Place In Every Work And Educational Setting. This 40"L X 20"W Table Comfortably Seats One Person While Conserving Floorspace. The Top Is Scratch- Spill-, And Stain-Resistant Laminate. Laminate Color Is Harvest; Paint Color Is Putty; Leg Finish Is Chrome.